If DTC P0125 is displayed with P0116, first perform the trouble diagnosis for DTC P0116. Refer to EC- 196, "DTC Logic". If DTC P0125 is displayed with P0117 or P0118, first perform the trouble diagnosis for DTC P0117 or P0118. Refer to EC-198, "DTC Logic". Voltage sent to ECM from the sensor is not practical, even when some time has passed after starting the engine. Engine coolant temperature is insufficient for closed loop fuel control. Check that вЂњCOOLANT TEMP/SвЂќ is above 10В°C (50В°F). Start engine and run it for 65 minutes at idle speed. 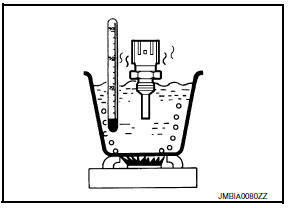 If вЂњCOOLANT TEMP/SвЂќ indication increases to more than 10В°C (50В°F) within 65 minutes, stop engine because the test result will be OK.
Be careful not to overheat engine. Is 1st trip DTC detected? YES >> Proceed to EC-203, "Diagnosis Procedure". Check the engine coolant temperature sensor. Refer to EC-197, "Component Inspection". When the engine is cold [lower than 70В°C (158В°F)] condition, grasp lower radiator hose and confirm the engine coolant does not flow. NO >> Repair or replace thermostat. Refer to CO-21, "Removal and Installation of Thermostat". Disconnect ECT sensor harness connector. Check resistance between ECT sensor terminals by heating with hot water as shown in the figure.